Hello, friends! I've been playing with the goodies in my March Birchbox all week, and I'm really excited to share them with you. I'm also equally excited that this month's box matches the blog's new color scheme, but that's beside the point. Without further ado, let's get into the unboxing! Birchbox is a monthly beauty and lifestyle subscription service. It sends 4-5 deluxe samples that are curated to your beauty profile. It is $10 a month, and has a wonderful rewards program, in which you can earn points for reviewing products and making purchases in the Birchbox Shop. You can then redeem those points for full-sized products! It's probably the best rewards program out there, in my opinion, which was one of the big draws in me signing up. If you're interested in subscribing to Birchbox, I would love it if you used my referral link. Thank you! Yes, I went with the the guest editor curated box, YET AGAIN. I just can't resist. They always have such a good variety of products in them, and knowing what's going to be in the box lets me decide if I'll get use out of all the products or not. The manager in me just loves it, though a small part me of misses the surprise. And, yes, before you ask, I also chose one of the guest editor boxes for April. I can't not pick them. This month's theme was beauty solutions, and unlike "being grateful," or some of their other themes, this box's products actually follow along with the theme! Though, I think every product is a solution to some "problem" or another than women feel they have, so once again, the theme is kind of a cop-out. But that's just me. The beloved info card. Isn't it so glorious and informative? This product tells you to spray it on damp hair before blow-drying, and since I let my hair air-dry 99.9% of the time, I haven't used this yet. But, what I can tell you, is that this smells absolutely awful. I can't even describe the scent to you. It's like...rotten popurri. It smells natural, but it's so incredibly strong that you can't detect one particular scent in particular. Does that make sense? I don't know. Anyway, I think this is the one product in this box that I'll be giving to a friend or swapping. I always like to try new skin care, and since moisturizer is an essential for me, getting samples allows me to put off buying more! This is a pretty decent-sized sample at half an ounce of product, so this should last me a little while. It's packaged in a jar, so any antioxidants or vitamins might expire before I get to use all of it up, so it's good that I have the smaller size! The compact got a little messy in shipment, but the product inside is still okay! And this is only the second Laura Geller product I've tried (the first being from my July Birchbox) so I was really excited to get it. And I'm just as excited to own it. I think this might be my favorite item in the box. It's a really beautiful color for my complexion, the kind that looks like a natural flush on my skin tone. It's similar to the Peony shade of the Stila Convertible Colors that I love so much. The powder is so incredibly soft, and it looks really natural on the skin. I think this is going to be my new everyday blush! I received a sample of this in my Sample Society box back in July 2013 and remembered really enjoying it, so I was really excited to be getting another one. The consistency is nice, and I like the SPF 37, since many of the eye creams I see on the market don't contain sunscreen. It does leave a bit of a white sheen on your skin until it fully absorbs, but that doesn't take very long. I usually just use my daytime moisturizer as an eye cream since it contains sunscreen, but now I'll be using this! I received Whish's CC Cream back in my August Birchbox, which had a wonderful coconut scent, so I was curious to try this one. I just finished up my Perlier White Almond Body Butter from my November Birchbox, so I was happy to get another almond lotion to replenish that. The texture of this is really nice. It's not too thin and and it's hydrating without being greasy at all, I'm normally not someone that dislikes the greasy residue a lotion leaves behind, but I was surprised at how it seems to instantly sink into your skin. One thing I will say is that the scent is a little strong, so those of you who are sensitive to scents might prefer to use this on your legs or something before bed so you're not smelling it constantly. I prefer the Perlier in scent, since it's a sweeter almond smell, kind of like biscotti, but this is good too. I won't be repurchasing this, though I'm curious to check out their other scents. I'll probably get the most use out of the skincare in this box, but the prettiest item is definitely the Laura Geller blush. The only item I don't like in this box is the Dear Clark hair stuff. Yikes, what a smell. Overall, I'm really happy with this box! I'll get good use out of 4/5 of the products, which is pretty good considering I've only ever tried the eye cream before. 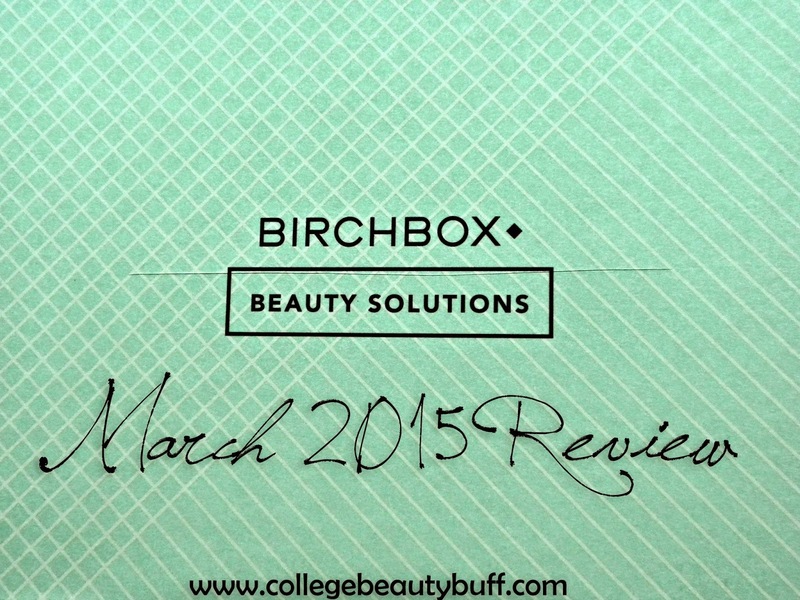 Want to see more Birchbox reviews? Click here! Like what you see? Click here to sign up for Birchbox! Disclaimer: Not sponsored. I paid ten whole dollars for this. So, there. 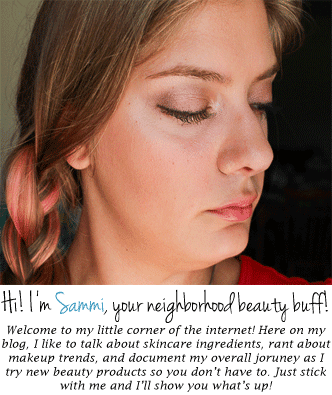 College Beauty Buff has moved! College Beauty Buff is 2 Years Old Today!